The Society started as the Burton and District Local History Society on 21 April 1975 at Burton Manor College. It grew out of a local history course there led by Paul Booth from Liverpool University. Paul Booth became our President in 1999. 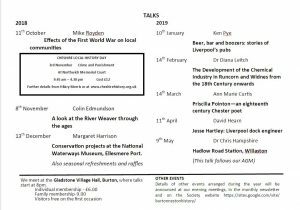 The Burton and Neston History Society now meets monthly for talks from October to May and outings or history walks are organised during the summer months. The Society has an active Research Group where members pursue their own research interests but also collaborate for projects such as exhibitions and publications. New members are always welcome – come along to a meeting and see if you would like to join. The Society’s prime purpose is to study and research local history, and its research work has resulted in a number of books, smaller publications and exhibitions. 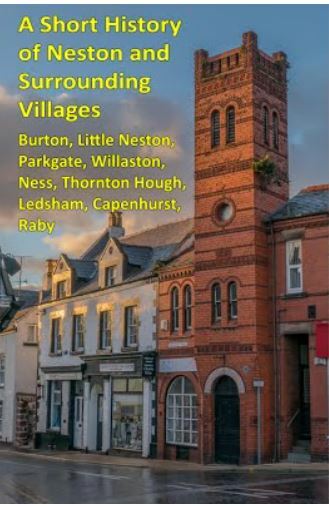 Burton in Wirral published in 1984, Neston 1840-1940 in 1996 and Neston at War, 1939 – 1945 published in 1999 are now out of print but are available in Neston Library and second hand copies may be bought online. 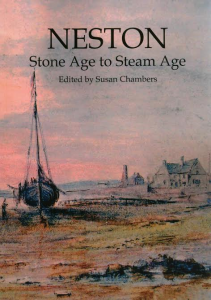 The Society’s most recent book, Neston Stone Age to Steam Age, was published in December 2014 and is for sale in local outlets and on Ebay. BNHS now has over 90 members, drawn mostly from Neston and the nearby villages of Burton, Parkgate and Willaston at the south end of the Wirral peninsula in West Cheshire. Neston & Parkgate are alongside the Dee Estuary, only a very short distance from the Welsh border, and it comes as a surprise to many that Cheshire should have a coastline. This unusual geographical location has had a strong influence on the development and history of the area and make it a popular place to live and to visit today. Download and fill in a membership form (click here) from BNHS website and either bring it with your membership fee to the next meeting or return by post to the address on the form. 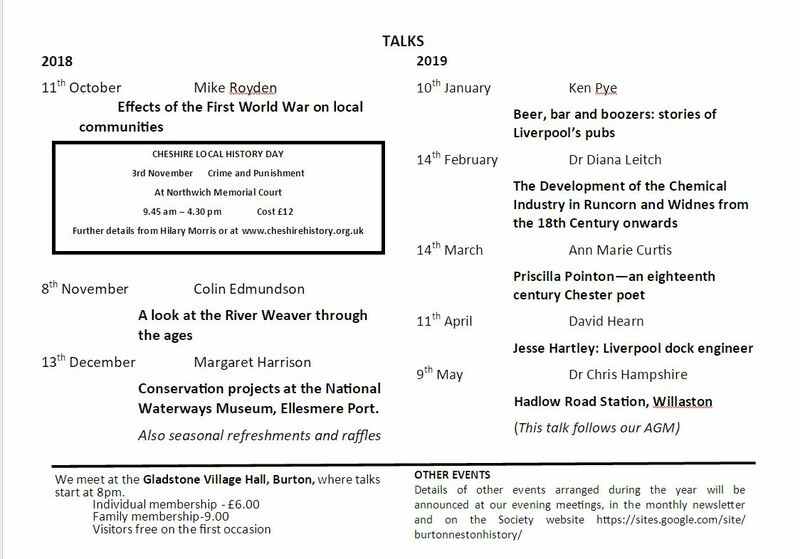 Monthly talks/meetings for members take place on the second Thursday of the month from October to May at the Gladstone Village Hall in Burton. Talks start at 8pm and last about an hour. Non-members/guests are welcome free of charge on the first occasion. Tea, coffee and biscuits are served afterwards. During the summer months local walks and an annual outing are arranged members will be informed about details of these at meetings, in the Society Newsletter, on the Society website etc. Society members have been actively involved in researching the history of the area for 40 years. The Society aims to promote an interest in and appreciation of the locality and its people and history through the sharing historical research. To those ends the Society holds lectures, discussions, field studies and visits to places of historical interest, collects and preserves documents and photographs relevant to the district, assists in the preservation of land, buildings and objects of historical interest and makes available to the public from time to time such writings or documentary evidence as may be available. Researchers are currently looking at the period after 1945. The Society has organized exhibitions on Coal Mining in Neston, the First World War, Emma Lady Hamilton, and ‘Then and Now’ contrasting photographs. In April 2016 it supported involved the Neston Georgian Festival. The Society aims to continue its research efforts and encourage others to develop and contribute theirs to further the understanding of the past and how it has shaped the present in the locality. Some of its researchers are now working on the period from World War II to the present. Neston Colliery Injuries Record Book – Neston Colliery Company Ltd.
Burton in Wirral – A History, was published in 1984 and Neston 1840-1940 in 1996. Both books are now out of print, but are available in Neston Library and secondhand copies may be bought online from sellers like Amazon, Ebay, Abebooks etc. In 1999 we followed these up with Neston at War 1939-1945 and in 2014 with Neston Stone Age to Steam Age. 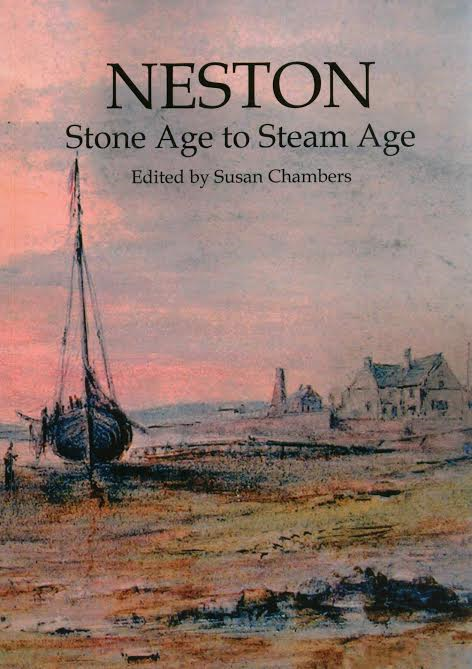 Neston Stone Age to Steam Age is for sale at the local outlets listed below at £14.95, on ebay or by emailing the Society on bnhsociety@googlemail.com. Also available, price £2 from the same outlets, is the Society’s latest publication: A Short History of Neston and Surrounding Villages: Burton, Little Neston, Parkgate, Willaston, Ness, Thornton Hough, Ledsham, Capenhurst and Raby. Neston’s Home Town Heroes – Research by Ian Norris. A printed copy of HomeTown Heroes forms part of the “Great War – Neston Remembers” Exhibition currently in Neston Library; the Exhibition will run until mid-November. After the Exhibition ends, HomeTown Heroes will remain in Neston Library as a permanent resource – but you are able to buy your own copy, for viewing on a computer, laptop or tablet (but not Apple iPad or on a TV) at your leisure. The entire work (around 1900 pages) can be purchased at the not-for-profit cost of just £5 for the CD version, or £9 on a USB FlashDrive (also known as a memory stick, pendrive, thumbdrive or USB) from the author. If postage/packing is required, an additional charge of £1 is made and further details of the work, and how it can be obtained, can be got from the author, Ian Norris, by emailing to: hometownheroesneston@gmail.com. Unfortunately, the CD/FlashDrive cannot be obtained from the staff at Neston Library and they are unable to take orders or details. For every sale of HomeTown Heroes a small contribution will be made to the Royal British Legion. 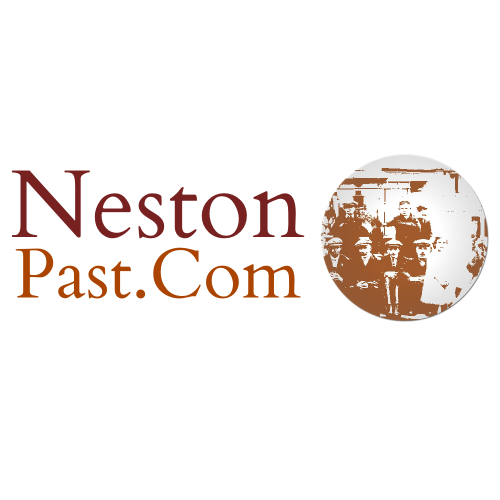 If you are looking for a known man who had a Neston or Burton connection, and who died in, or as an immediate consequence of, the First World War, you should be able to locate his account in HomeTown Heroes. If he’s not there, please get in touch with me on the above email and I’ll see if I can track him. Whilst HomeTown Heroes (nearly) concludes one chapter in our local history of the First World War, there is much more that needs to be researched and written – what are the stories of those who served, and survived, and how did the war change the face of Neston and Burton? If you would be interested in helping with this absorbing work, please do get in touch with me at hometownheroesneston@gmail.com.